Across Maine, patient-centered medical homes and their community care teams are improving quality and patient outcomes while reducing overall health care costs. 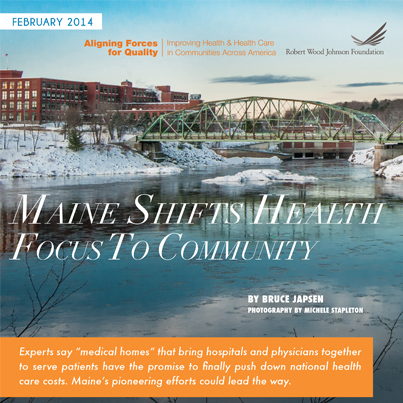 Funded in part by RWJF’s Aligning Forces for Quality (AF4Q) initiative, Maine’s Patient Centered Medical Home Pilot has a broad reach—not only coordinating patients’ care and serving as a reliable resource, but also linking patients to services like food banks and mental health case workers. Results from the medical home initiative include a 40 percent reduction in readmissions at one participating hospital. Health policy journalist Bruce Japsen—whose work has appeared in the Chicago Tribune and Forbes— explores the pilot’s success and growth from the perspectives of patients, clinicians and state leaders, as part of “Journalists on Quality,” a series of insightful profiles on how AF4Q is transforming care in local communities.